Authentic Preparation of Tamil Nadu. very tasty and good for health. You can have it alone (like soup when you have cough and cold) or with rice and any dhal curry. Heat oil in a kadai , put mustard seeds, chopped onions ,whole red chillies, curry leaves then fresh paste of garlic-pepper corns and needed salt . saute for a minute. Add tomato - tamarind pulp 1 cup with 1 cup water and the remaining chopped coriander leaves and ginger juliens. when the rasam brings to boil, remove the kadai from the flame and close with a lid. Serve hot with plain rice and dhal curry. sounds a good recipe, but why no salt? 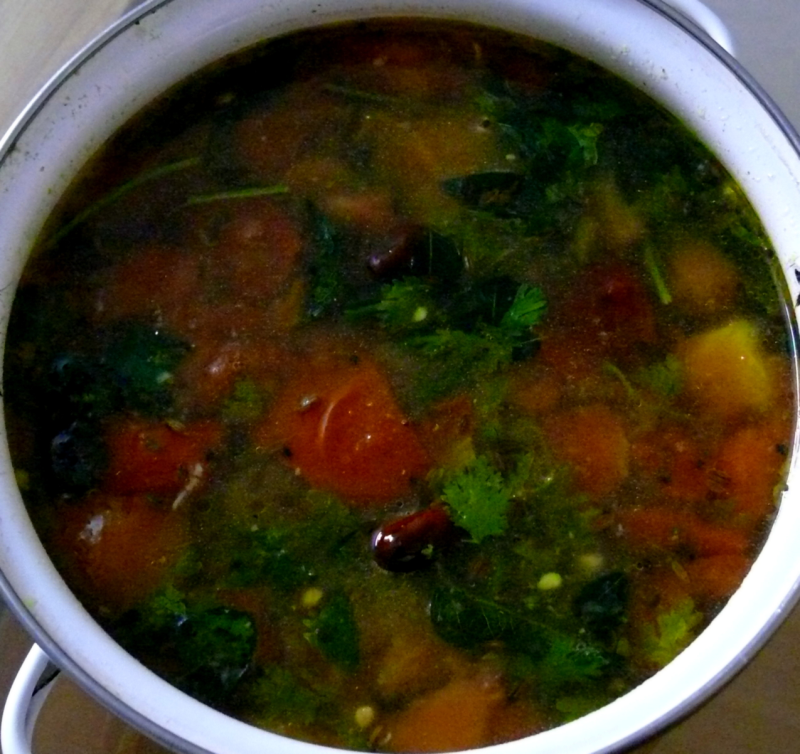 Awesome Spicy Tamil Nadu rasam . tried this rasam as kids had cold. a kind of. i noted onion as a ingredient in rasam.quite new for me.i will try this one. Add half of the chopped coriander and a pinch of asafoetida powder , when you crush 2 tomatoes (with hands) in tamarind pulp.This will add to the taste. You can add 3 cups water when you add the tamarind pulp if you want to have this rasam with rice.Otherwise , if you want to have it as soup, strain the recipe preparation as such and serve hot in a soup bowl.